LONDON — Britain’s far right has never been so politically weak, fractured or disorganized. 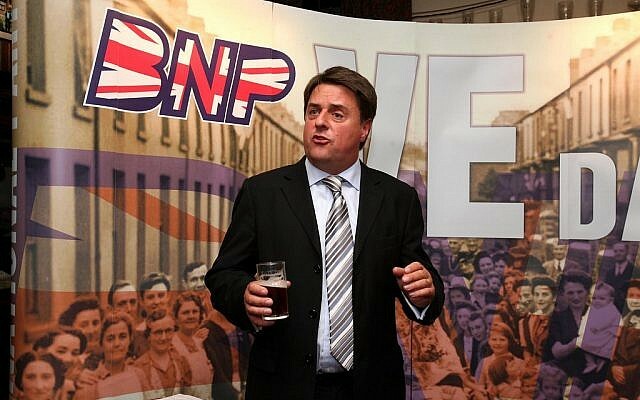 The British National Party – whose leader, Nick Griffin, once warned against the “unholy alliance of leftists, capitalists and Zionist supremacists” which had conspired “with the deliberate aim of breeding us out of existence in our own homelands” – is now a spent force. A decade after winning nearly a million votes and seats in the European Parliament and London Assembly, the far right is now “almost extinct,” in the words of the anti-extremist organization Hope Not Hate. That threat has seen growing warnings by the police of the danger of far-right terrorism. Last year, Mark Rowley, then the UK’s most senior counter-terrorism officer, warned that the “right-wing terrorist threat is more significant and more challenging than perhaps public debate gives it credit for.”But counting votes or membership rolls, its opponents fear, fails to capture the nature of the threat it poses. Over the previous two years, he suggested, far-right activity had evolved from unpleasant protests and hate crimes committed by isolated individuals. “Right-wing terrorism wasn’t previously organized here,” he claimed. 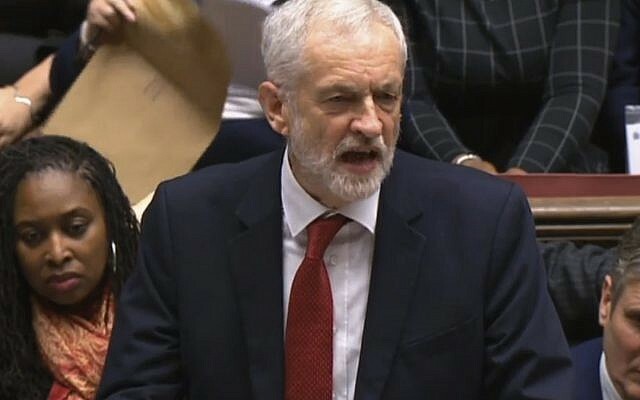 Thus while much media and political discussion on anti-Semitism over the past three years has focused on the opposition Labour party and its leader, Jeremy Corbyn, that attention has somewhat disguised the danger posed by the far right — a danger which the country’s current political instability and divisive debate over its planned departure from the European Union appears to be fueling. “I am concerned by the threat from a disaffected, street smart, social media-adept right in this country that is learning from the populist right in Hungary, Poland and also the United States,” argued Julius, who has written a history of anti-Semitism in England and represented the historian Deborah Lipstadt in her libel battle against Holocaust denier David Irving. This “new wave” poses a direct threat to Jews, experts believe. 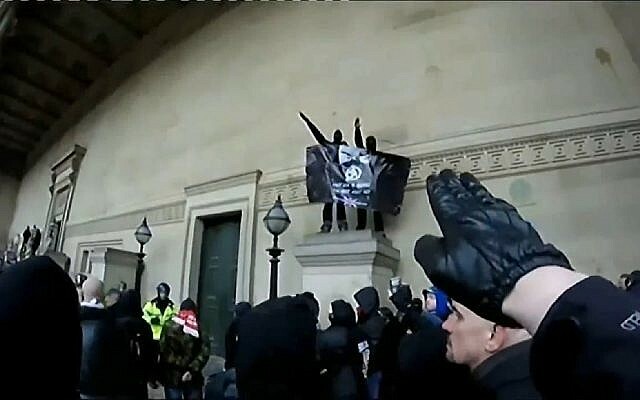 British police make a distinction between those elements of the far right whose rhetoric and activity is lawful — although offensive — and an extreme right wing, which includes proscribed terror groups such as the neo-Nazi National Action. Some elements of the former have managed to capture considerable media attention. 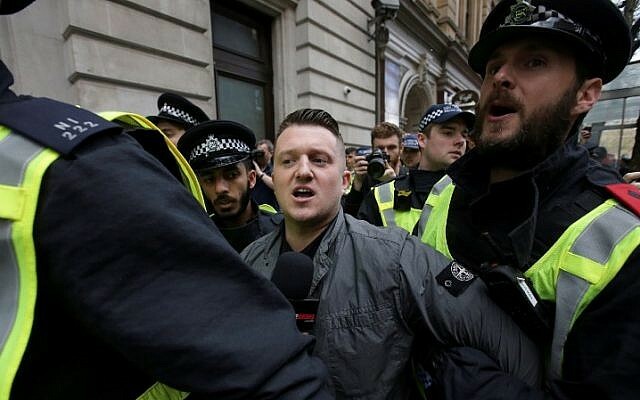 Tommy Robinson, the onetime head of the now virtually defunct anti-Muslim English Defence League, became a cause celebre among the British, European and American far right after he was briefly jailed last year for allegedly endangering the trial of a group of Asian men convicted of sexual offenses against girls. A petition supporting Robinson, who was later released on appeal, was signed by 500,000 people and the Trump administration lobbied the British government about the case. But Robinson, who was also once a member of the BNP, remains toxic even on the fringes of mainstream politics. The decision of the right-wing United Kingdom Independence Party (Ukip) to embrace Robinson – he has become an adviser to its leader and figured prominently in its “Brexit betrayal” march in December – has caused ructions. 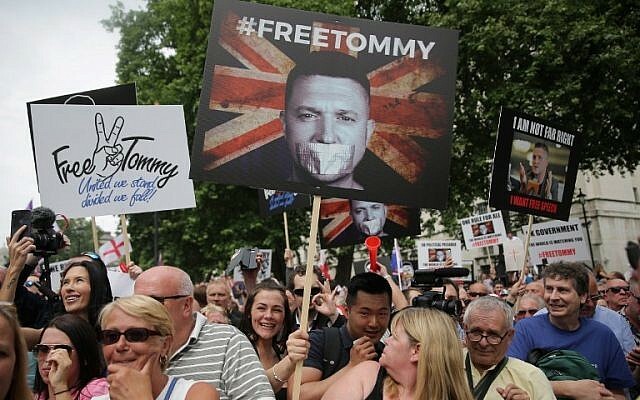 Britain’s police have served notice that – particularly in the heated atmosphere generated by Brexit – they are watching the language and activities of far-right activists closely. Dave Rich, head of policy at the Community Security Trust, which monitors anti-Semitism and protects Jewish venues and events, shares these concerns. 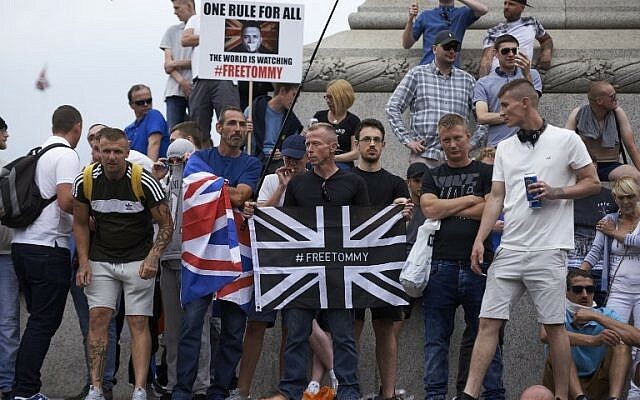 “There is no doubt that far right groups and leaders have tried to use Britain’s current political instability and sense of division as a platform for their own growth, with varying degrees of success,” he argues. 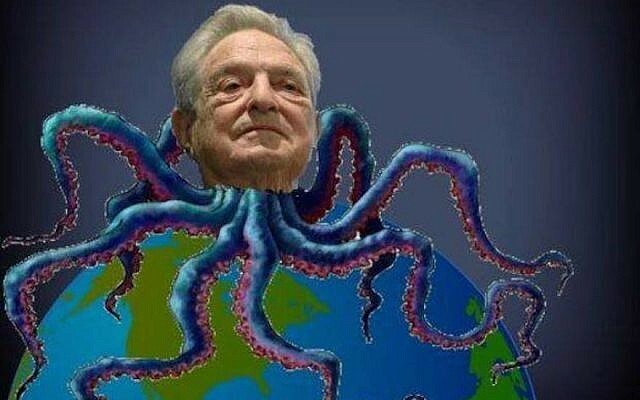 “Online agitators like Tommy Robinson and the thuggish street movements that follow them tend to concentrate their attention on immigrants and Muslims, while smaller, more violent groups like National Action and its successor organizations are more openly anti-Semitic and neo-Nazi,” he adds. The government and law enforcement agencies appear to agree. In October, it was announced that MI5, the domestic security service, will take over from the police the lead in combating far-right terrorism. This officially designates the danger as a major threat to national security, and places it alongside Islamist terrorism and that related to the conflict in Northern Ireland. Four far-right terror plots have reportedly been stopped in the UK over the past two years. While that is smaller than the 14 Islamist plots which have been foiled by the security services during the same period, there are believed to be around 100 ongoing investigations into extreme right-wing activity. The police warnings have been borne out by a series of high-profile cases over the past three years, including the assassination of the Labour MP Jo Cox a week before the 2016 Brexit referendum. Far-right terrorist Thomas Mair shouted “this is for Britain,” “keep Britain independent” and “Britain first” as he repeatedly shot and stabbed the MP. During his trial, it was revealed that Mair was obsessed with the Nazis, and his browsing history revealed searches about Israel, prominent Jews, and white supremacism. Last month, six people were jailed for membership in National Action, one of a number of similar trials which took place during the course of 2018. 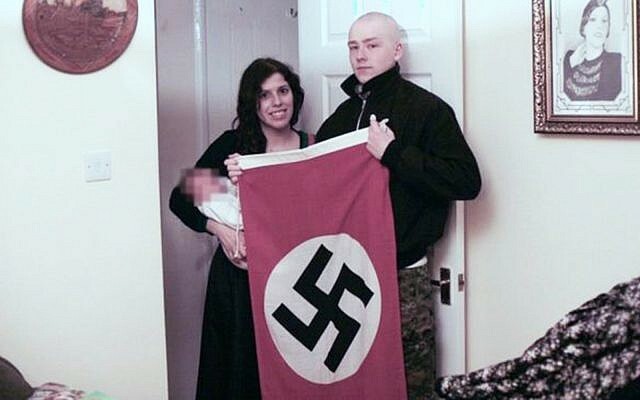 Among those who received prison sentences were Adam Thomas and his partner Claudia Patatas, who named their baby after Adolf Hitler and whose home was littered with Nazi paraphernalia, knives and crossbows. During the trial it was revealed that Thomas had spent time at a yeshiva in Israel and attempted to convert to Judaism. Patatas’s virulent anti-Semitism was evident in private messages she sent to a fellow defendant: “All Jews must be put to death,” she wrote. A third trial saw the conviction of another National Action leading light, Mikko Vehvilainen. Describedby the BBC as “perhaps the most dangerous member of the group,” he was a serving lance corporal in the British Army. Vehvilainen stockpiled weapons for an imminent race war, attempted to recruit fellow soldiers, and harbored an intense hatred of Jews. 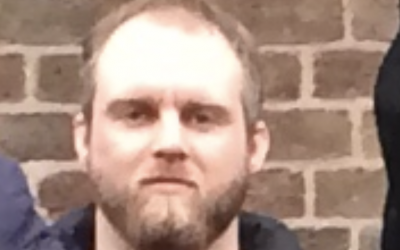 He wrote in one online forum: “I have vowed to fight the Jew forever in any way possible.” (Vehvilainen was cleared of stirring up racial hatred). National Action’s origins show the slippery slope from far-right electoral politics into the kind extremism which now occupies the police and security services. One of National Action’s founders, Alex Davies, was a former member of the BNP. But both he and co-founder Ben Raymond believed the far right had lost its way in the search for votes. National Action – avowedly neo-Nazi, Jew-hating and Holocaust-denying – was to be the antidote. Never big numerically, National Action was nonetheless considered highly dangerous by the police. Like its Islamist counterparts, National Action targeted disaffected teenagers and young people; glorified violence and terror (“We must be ruthless – and if innocent people are cut down in the process, then so be it,” one leading member declared); and sought the mass murder of Jews. “It is with glee that we will enact the final solution across Europe,” National Action documents stated. With their talk of “white jihad” and online videos featuring masked, knife-wielding members and black flags, National Action appeared quite consciously to ape the Islamists they supposedly hated. Jews were by no means the only group National Action had in its sights. Muslims, Asians and black Britons, as well as white “race traitors” like Cox, were similarly on its target list. Nor was all this idle talk. One member was convicted of carrying out a hammer and machete attack on a Sikh dentist, another was arrested for posting images of a homemade pipe bomb and making threats against Muslims. Some elements of the British far right have explicitly disavowed anti-Semitism and presented themselves as friends of Israel. Interviewed by the Jewish Chronicle in 2015, Robinson sought to dispel the notion that, after attacking Muslims he’ll inevitably move on to Jews. Prof. Matthew Feldman, director of the UK-based Center for Analysis of the Radical Right, believes that some elements of the far right in Britain are, in common with their counterparts across Europe, attempting to shake-off their association with anti-Semitism. “The most likely explanation for this is a widespread turn toward anti-Muslim hostility in Britain, and Europe more generally, this century,” says Feldman. “Many radical right activists in Britain today — especially those who do not subscribe to neo-Nazism or other forms of eugenic racism or overt, revolutionary fascism associated with the radical right prior to the end of the Second World War — are likely to embrace Jews and/or Israel as an expression of anti-Muslim prejudice,” he says. He is, though, unconvinced by this apparent shift. “It is difficult to see this ‘marriage of convenience’ as anything other than skin deep. Put simply, these groups are likely appropriating support for Israel and or the Jewish Diaspora as a perceived way to express hostility to Muslims in Europe, and more specifically, Britain,” Feldman says. Moreover, Feldman suggests, even absent the threat of terrorism, far-right activity comes with a heavy price for Jews, quite literally. “The risks posed by the radical right in Britain extend beyond this,” Feldman says, and include harm to community cohesion and the costs of policing the often violent demonstrations, which can run into the hundreds of thousands of pounds. Other costs, he says, include “increased hate crimes, and increased feelings of threat by ethnic, religious or other minorities in the UK. The publication of online extremist material is also substantial, and like the above risks directly targets Jews in Britain,” he argues. The latest available hate crime statistics from the CST bears this out. They indicate that, of the 727 anti-Semitic incidents recorded in the first six months of 2018, there was some form of political discourse in 341 of them. Of these, 209 featured far-right discourse.